Are you looking for a tasty meal that you can prepare for a group of friends? Something you might want to make at home is a meatloaf roll. A really easy meatloaf recipe is available that you can do outside or in your kitchen. Prepare your grill by preheating it to 300 degrees. Cook the bacon by letting it smoke for about an hour. Dice the celery and onion to add to your meatloaf recipe while waiting for the bacon to cook. Place ground chuck on the cutting board and flatten to ½ of an inch thick. Add the spices and the sauce you want for flavor. 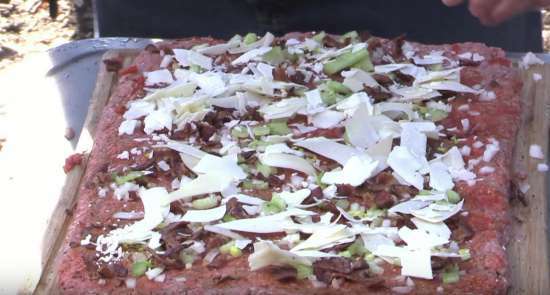 Add your celery, onions, and cheese just like you are making a pizza. Roll the ground chuck and form it into a roll. Place the roll on the grill and cook for at least 50 minutes or the internal temperature is between 150 and 160 degrees. The last thing to do for your meatloaf recipe is to allow the meat to cool. Cut your meatloaf into slices and serve with rolls or hamburger buns.